Recent discoveries have given rise to a new class of electronics known as “spin electronics” or “spintronics,” which uses the electron spin rather than its charge to create polarized currents. Spintronics is currently experiencing an extraordinary development with the manufacture of nanoscale devices based on ferromagnetic materials and semiconductors. Their applications are numerous, ranging from recording, electronics, and optoelectronics to quantum information. Spintronics is a new generation of electronics that has brought and continues to bring a lot of progress to information storage; this is due to the discovery of new materials with new functionalities and multiple applications. The discovery of giant magnetoresistance (GMR) in 1988 by Albert Fert and Peter Grünberg (receiver of the Nobel Prize in Physics in 2007) is considered a starting point of spintronics. GMR is based on the variation of the electric current in the presence of a magnetic field. The spintronics has made important contributions to the miniaturization desired for electronics; it uses nanometric components for processing and storing information. However, the limits of miniaturization on a nanometric scale are known, and it is imperative to develop new ways and new materials to exceed those limits. The most desired properties for these materials are high spin polarization, modular magnetic properties by an electric field and a long lifetime of the spin polarization. 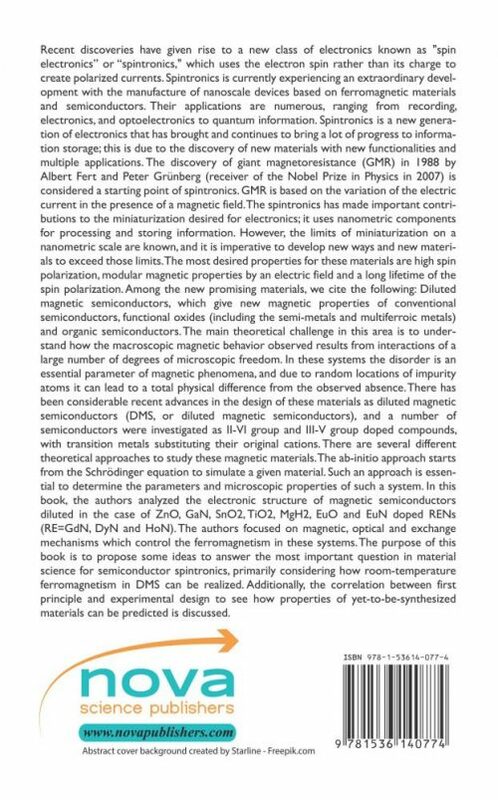 Among the new promising materials, we cite the following: Diluted magnetic semiconductors, which give new magnetic properties of conventional semiconductors, functional oxides (including the semi-metals and multiferroic metals) and organic semiconductors. The main theoretical challenge in this area is to understand how the macroscopic magnetic behavior observed results from interactions of a large number of degrees of microscopic freedom. In these systems the disorder is an essential parameter of magnetic phenomena, and due to random locations of impurity atoms it can lead to a total physical difference from the observed absence. There has been considerable recent advances in the design of these materials as diluted magnetic semiconductors (DMS, or diluted magnetic semiconductors), and a number of semiconductors were investigated as II-VI group and III-V group doped compounds, with transition metals substituting their original cations. There are several different theoretical approaches to study these magnetic materials. The ab-initio approach starts from the Schrödinger equation to simulate a given material. Such an approach is essential to determine the parameters and microscopic properties of such a system. In this book, the authors analyzed the electronic structure of magnetic semiconductors diluted in the case of ZnO, GaN, SnO2, TiO2, MgH2, EuO and EuN doped RENs (RE=GdN, DyN and HoN). The authors focused on magnetic, optical and exchange mechanisms which control the ferromagnetism in these systems. 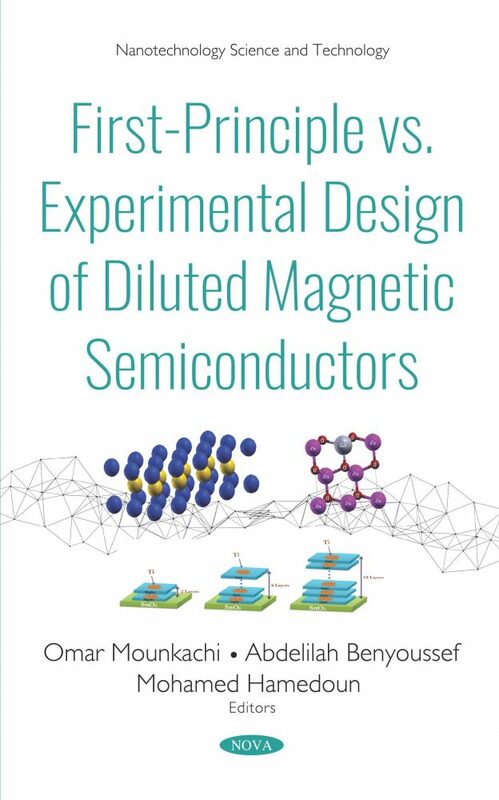 The purpose of this book is to propose some ideas to answer the most important question in material science for semiconductor spintronics, primarily considering how room-temperature ferromagnetism in DMS can be realized. Additionally, the correlation between first principle and experimental design to see how properties of yet-to-be-synthesized materials can be predicted is discussed.